Easy to adjust, this swing arm floor lamp lends a crisp, modern look with a satin nickel finish. Created by Possini Euro Design®, this swing arm floor lamp is a sleek addition to deliver energy-efficient LED illumination to a living area or home office. This lamp features metal construction with a cool satin nickel finish, offering contemporary flair. The shade is a metal dome, delivering directed lighting that's perfect over a reading nook or lighting a home office. Adjustable from 40 1/4" to 58" high overall. 23" arm extension. Shade is 5 1/2" wide x 5 3/4" deep. Base is 11" wide x 1 1/4" high. Weighs 14.74 lbs. Includes one 7 watt COB LED bulb. 500 lumens. 3000K. Three-step touch dimmer switch on top of center post. Eliptik energy-efficient LED swing arm floor lamp by Possini Euro Design®. Satin nickel finish; aluminium and iron construction. 40 inch height. 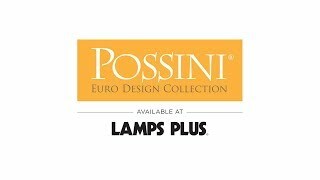 I've owned Possini floor lamps before. Beautiful, sleek, looks like it will work very well. 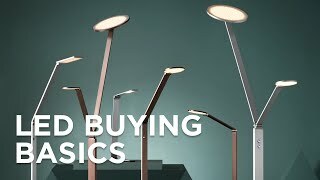 We shopped for a good quality, swing arm transitional lamp preferably with LED. The style stood out from the rest for him. We will see how it works out. I had bought several of these in the past and am impressed by the quality as well as the design. They are very heavy, very solid. Very functional. Great lamp. Sleek, modern design and LED lighting. We need a small floor lamp in nickel for a spare room. It appears that it will work fine. Does the satin nickel finish have a brown tint or more like brushed chrome? The finish is more like brushed chrome. Where is the cord attached, to the base? BEST ANSWER: Hi - The cord exits from the back of the round floor base. Does the LED bulb give off a warm (like an incandescent light) or cool ( blue/white) type of light? BEST ANSWER: Hi, I bought 2 of these lamps. The light is warm (I hate the blue light). I use the lights behind reading chairs in each bedroom. They are excellent, but also can be dimmed. They well designed. Look great. There are three lighting options with the switch on this floor lamp. Tap once for warm out to three taps for very bright light. Quality of lamp is top notch. I just received this lamp but can not figure out the on off switch? I push the button, but nothing happens? Also, it will not dim as stated. What am I doing wrong? BEST ANSWER: Hi - You should be able to turn it on/off and dim the lamp just by touching the switch located at the top of the center post. If it still does not work, try unplugging it and then plugging back in. If you have a wall switch connected to the plug, just be sure the wall switch is in the on position. BEST ANSWER: Hi, the switch is located on top of the vertical pole. Is this is a good reading lamp? BEST ANSWER: Hi - With the adjustable arm and using LED technology along featuring a dimmer, this would be an excellent reading lamp. BEST ANSWER: Hi – the light operates off of 120V AC (line voltage). BEST ANSWER: Hi - the LEDs are built-in (integrated) and non-replaceable. But, they have an approximate life expectancy of 30,000 hours. Can the head turn as well to shine on the wall? BEST ANSWER: Hi, the lamp head can swivel from side to side, 180 degrees. Great style and gracefully balanced. Artistically designed and wonderful range of light at 3 different settings. Attractive satin nickel finish. Height extends and light swivels easily. Arrived safely and was well packed. Will likely order another one to match soon. More than adequate cord length. Perfect to look at and read by. Excellent quality, sophisticated design, triple light levels, and great value.